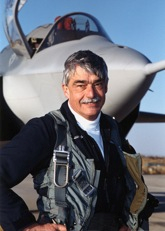 Among his many notable achievements, Mr. Morgenfeld flight tested the F-117 and YF22A aircraft, wasthe Chief Test Pilot on the Joint Strike Fighter (JSF) program, and performed the first flight test on the X-35. In addition to being a top test pilot, Mr. Morgenfeld was a Navy Fighter Pilot with two combattours totaling 120 combat missions and over 500 carrier landings in the F-8 Crusader jet. Between combat tours, Mr. Morgenfeld earned his Master of Science Degree in Aeronautical Engineering at the United States Naval Postgraduate School. He was named Chief Test Pilot for the Skunk Works in 1991 and promoted to Director of Flight Operations in 1999. During the course of the JSF program Mr. Morgenfeld tested all three versions of the airplane and will be sharing many of his X-35 test experiences and technical applications during his presentation. The Ares I-X flight test was primarily conducted to verify that control of the most slender and aerodynamically unstable rocket ever would be feasible. A NASA-led effort was conducted largely using components available from the Shuttle program to test the new design. The Ares I-X, a replication of the outer mold line of the Ares I configuration planned as part of the new space transportation system, stood 329 feet tall, making it the tallest rocket in the world, and the third tallest ever. This talk will present an overview of the design, analysis, and testing conducted on the very successful Ares I-X flight test vehicle. A representative from each of the sponsoring NESC TDTs will brief participants on topics related to the TDT. The talks will be as follows: Status of the Passive Thermal TDT, Testing the Solid Oxygen Generator Explosion and Rate of Burn on MIR, ISS, and Submarines (Active Thermal TDT), and Present Technical Challenges in the Aerosciences Discipline. In 1989, Pons and Fleischman made their infamous "Cold Fusion" announcement promptly ending their careers. Despite this the study of the Pons-Fleischmann Effect continues to this day. This talk will cover some selected historical highlights from the past 20+ years that gave rise to the emerging field called Low Energy Nuclear Reactions (LENR). The body of evidence strongly suggest that the LENR effect is real, increasingly understood, and most recently, may actually be useful. The experimental approaches and evidence along with several theories will be presented. One theory, Widom-Larsen Theory (WLT), will be discussed in detail. The practical application of LENR to aerospace will transform virtually every aspect of system design. �Humans will go to Mars in about 25 years� is becoming an invariant. Wernher von Braun wrote about a crewed mission to Mars in 1948, proposing that it be launched in 1965, but by the time the Viking Landers had been deployed successfully on Mars in 1976, it had come to be assumed that humans would go to Mars in about 25 years. That has been the case through both Bush administrations and is more or less the case today. The Mars Science Laboratory mission is demonstrating the challenges and the costs associated with executing increasingly sophisticated serial surface exploration missions and the number of interesting surface exploration sites is increasing at a rapid rate. Hence, it is logical to assume optimistically that new rovers and other sophisticated surface probes will be developed and launched every 26 months into the foreseeable future and NASA and ESA will not be sending humans to Mars for at least 25 years. Autonomous systems are replacing humans in a variety of terrestrial tasks considered to be either too boring or too dangerous, and the simultaneous development of miniaturized instrumentation and associated digital devices are causing these systems to become smaller and smaller. Humans can�t fit into the latest unpiloted aerial vehicles and those vehicles can stay in the air longer than most humans are willing to go without food or rest. While Osama Bin Laden was important enough to send humans after him, most of the other terrorist leaders are being �deactivated� using unpiloted vehicles. Similar capabilities are being utilized for planetary probes and as these devices become smaller and more sophisticated, it becomes harder to justify the development heavy entry, descent and landing capabilities for near term missions to Mars and other planetary bodies. It will be at least 25 years before we have the necessary technical capabilities to send and safely return a crewed mission to Mars. Since 1978, the speaker has been involved in research focused on enabling round trip missions to Mars. During that time, he and his colleagues at Jet Propulsion Laboratory published the first serious study on utilizing local planetary resources at Mars to facilitate less expensive round trip missions. In 1978, the need for human explorers was clear and the risks associated with a three-year crewed mission to Mars were less clear. In 2011, the risks associated with a three-year crewed mission to Mars are clearer, but the need for sending humans to Mars is less clear. It is time to redefine our priorities for systematic planetary exploration�particularly as they are related to Mars. Mars is more intriguing today than it was in 1976, but human missions will always be 25 years from now, unless we adjust our exploration goals and objectives. Rather than continuing our serial exploration of Mars, it is time to focus on building a fixed robotic base in close proximity to water both for scientific and sustainability purposes. A fixed base that can support a range of long-distance exploration sorties from the surface of Mars rather than from Earth is the only way that we will be able to shorten the horizon for crewed missions to Mars. This talk will focus on a human agent approach for Mars surface exploration as a means to accelerate the build-up of the capabilities required for a crewed mission to Mars. That approach is only possible if heavy entry, descent and landing capabilities are incorporated in our near-term technology development programs.